Many salaried persons don't get unsecured loans from banks, due to strict guidelines from the regulator. Banks restrict doing so to borrowers who earn above a certain limit, such as Rs 25,000 a month, and employed with reputed companies. Also, if you are looking for a small loan of, say, Rs 25,000, banks might not show interest, due to the cost they incur. "Even in developed countries like the US, only 20 per cent of the population has access to credit at moderate interest rates," says Vaddadi Shankar, founder of i-lend.in. Now, such left-out borrowers can turn to online platforms that connect them to individual lenders willing to take the risk. Termed peer-to-peer (P2P) lending, it is not new to India. Many proprietors and the unbanked population borrow from individuals. In this case, there's a middleman who knows the moneylender and can vouch for the borrower's credentials. The online platforms work more like a bank. There's evaluation of credit worthiness and repayment capacity. An equated monthly instalment (EMI) is fixed. Borrowers and lenders need to go through Know Your Customer (KYC) requirements. Borrowers with lower credit risk get a lower interest rate and vice versa. The rate varies between nil and 36 per cent. The loan amount can be as low as Rs 25,000 and as high as Rs 5 lakh, for tenures between six months and three years. Bhuvan Rustagi, co-founder and operations head at Lendbox.in, explains that unlike taking a loan from a bank, these platforms are do-it-yourself. So, there will be no executive visiting to collect documents and provide other services. A borrower needs to scan and upload documents for KYC, such as photo, PAN card, Aadhaar card and passport. Then, they need to provide income-related documents such as six months' bank statement, three months' salary slip and income tax returns. "The registration fee is to ensure only serious borrowers come to the platform. In the early days of operations, many borrowers backed out at the last minute," says Rajat Gandhi, founder and chief executive (CEO) at Faircent. Many of these companies also have registration charges to cover the costs associated with KYC and physical verification. They also go through a borrower's credit score. While some get it through partnerships with credit bureaus and non-banking finance companies, some ask the borrower to get it from a credit bureau and upload it. Many of these entities also go beyond the usual checks and rate borrowers based on the latter's social score. They use software that looks at an applicant's friends and connections on social networking sites such as Facebook and LinkedIn, and their activity. Based on it, they assign a score. Using 25-30 parameters, these companies evaluate borrowers and put them in different risk categories. Those with a higher risk get loans at higher interest rates and a person deemed likely to repay the loan diligently gets lower rates. Antriksh Hooda was rejected loan from a bank as he had issue in the Cibil report, He managed to get money from one of the online platforms. "While I got the loan at 14 per cent, it took me more than two weeks," says Hooda. Those looking to use these platforms to make extra money by lending to individuals also have to go through the KYC. Most of these platforms don't charge lenders any registration or processing fee. Some don't allow a single lender to fund the entire requirement of a borrower. 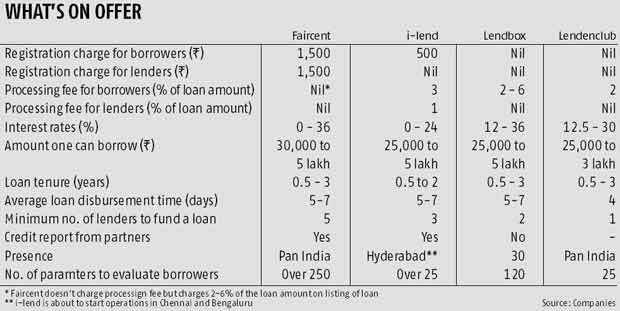 Faircent, for example, requires a minimum of five borrowers to fund a loan and i-lend three. Gandhi says the idea is to build a loan portfolio that spreads the risk for lenders, in case one goes bad. Faircent also requires lenders to bid for each loan. As a result the borrower gets different interest rates for part of his/her loan. A lender also gets to see the relevant documents of the person seeking the loan. Bhavin Patel, co-Founder and CEO at Lendenclub.com, says with the existing regulations, the process of signing the deal is mostly offline at present. When all parties agree, the online platform sends an agreement copy to the borrower and lender(s) to sign. If there are several lenders, the borrower needs to sign that many copies. The agreement is then converted to a legal document by franking. A borrower also needs to send cheques for each monthly payment. So for a one-year loan, he/she will need to issue 12 cheques to each lender. If there are five of the latter, 60 cheques need to be issued. These are kept with the online platform arranging the loan. The repayment can be made through net banking. If a payment is delayed, the borrower needs to pay a penalty, which varies across platforms. If the borrower defaults, the case is handed to a third party recovery agency. This agency would file two cases. A civil case for dishonouring the agreement and a criminal case for cheque bounce. Borrowers: These platforms cater to a specific audience, lacking access to bank credit. If a bank is willing to lend to you, go for it than for individual lenders. A borrower needs to give more documents in P2P lending compared to taking a loan from a bank. In the case of an institutional lender, the company sends an executive to help you with the entire process, and you don't have to give numerous post-dated cheques and sign multiple agreements. The loan is also disbursed faster. If you are a credit card customer or have a long relationship with the bank, they also offer pre-approved loans at a lower rate of 14-15 per cent. Taking a loan from a bank would also help you to build a credit history, that can come handy in the future. Lender: It's a high-risk investment and you should keep it small until the Reserve Bank of India comes up with norms for this sector, expected later this year. While it lets you earn a good return on investment, P2P lending is at a nascent stage in India. These companies are not regulated. They have adequate systems and processes for evaluation and recovery but in case of default, recovery would be slow and costly (lawyer's fee to fight the court case). These entities also fear the possibility that the same borrower can go to different portals and arrange loans on each. As the data of these companies are not shared with credit bureaus, there's no way for a lender to get such information. You also need to watch for money lending regulations that apply on individuals. In many states, if a person earns more than 30-40 per cent of income through lending of money, he/she needs to register. Have loaned Rs 1 lakh to different borrowers.